I love soldering. I love making cables. I've even written excessively about it on this site (here, here and here). There is just something satisfying and rewarding about making your own mic cable, or a sub snake, or a patch bay. Perhaps it's the joy of knowing you just made future set ups a little easier. Or saving a few bucks. Or the contact high you get from breathing vaporized flux. Either way, it's great fun. Moreover, I love it when other people "get the fever." The other night, two of our audio guys and I spent some quality time making sub snakes and cables. After I showed Rob, our newest and youngest sound guy, how to make a mic cable he proclaimed, "I'll never buy another cable again!" Ah, the sweet smell of victory. Or was that burning flesh? Sorry about your thumb, Rob. I hope it feels better today. 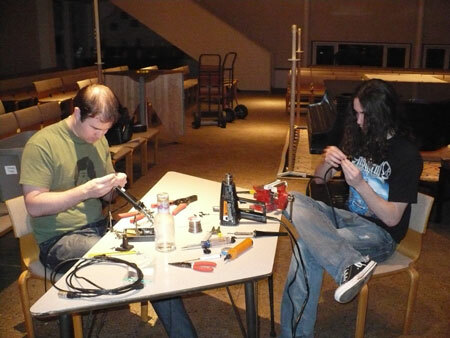 Erik (left) and Rob making cables at our improvised soldering station. Note the extreme concentration. These guys are serious about soldering!The goal of the evening was to build a couple of subsnakes to simplify set up and neaten up the stage. We would build one snake with 4 XLRs and 2 Ethercons and one with 3 of each. Since we only needed a 6 port boxes, I had to come up with a creative solution. 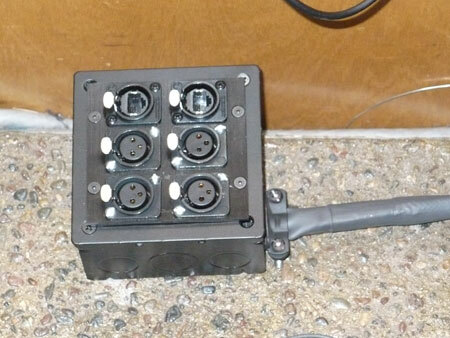 Most factory snake boxes are 12 ports and up, and are a good $60 or more. I didn't have that in the budget. And they're way too big. It turns out Middle Atlantic makes a very cool modular rack panel system. You can find them at Markertek by following that link back there. They have all sorts of modules that bolt to a set of rack bars and you can create a custom patch panel. They also make an adapter plate that allows those panels to connect to a standard 4" square electrical box. Problem solved. A custom little sub snake box on the cheap.I bought the electrical boxes at Home Depot and shot them with about 5 coats of black spray paint. 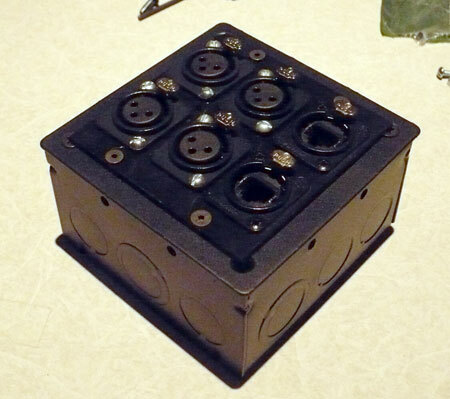 Minus connectors, the box costs under $20, and at 4" square by 2 1/8" deep, it's small and unobtrusive. I also picked up some loom at our local electronics mega-mart (Electronics Center in Golden Valley, MN), and we settled down for a fun night of soldering. The box above will live on stage between the keybaord and bass players. We use 2 keyboards, so that's 2 jacks, the bass is a third and we have a spare. The two Ethercons will feed their Avioms. The box in place.We used heat shrink tubing to cover the end of the loom and keep it from fraying. The hardest part of the night was getting the 4 channel snake cable and Aviom cables down the loom. The stuff works like a Chinese finger, and is quite challenging. The other box will sit next to our worship leader and pick up his mic, his guitar and the background vocal. We threw an extra Ethercon in that one just because. In the future we can always swap it out and put in another XLR if we need to--the audio cable is there. Combining 3 mic lines and 3 Aviom lines will make set up and tear down go a lot faster.I forgot to take picutes at the end, but we also labeled each input on the boxes as well as the cable ends, so it's really a plug and play set up. We made up a few custom length cables to plug into these boxes (a set of two 1' mic cables for the keys DI--a Radial ProD2--for example) to further speed set up. 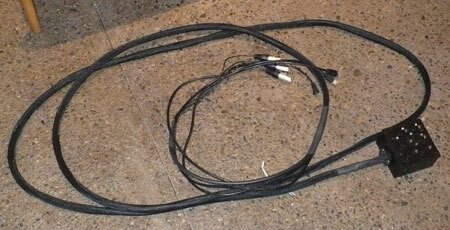 We also shortend up the Aviom cables that go from the boxes to the mixers themselves. I'm a big fan of using as short a cable as possible all the time. It makes clean up go a lot faster when you're wrapping 100' of cable instead of 300'. In the coming weeks, I'll be marking out lengths for mic cables for the rest of the band and we'll make those up another evening. This works for us since our set up is pretty static. If you need more flexibility, you'll have to be more strategic in how you plan your cable lengths. Either way, I'd recommend a few little snakes like this.